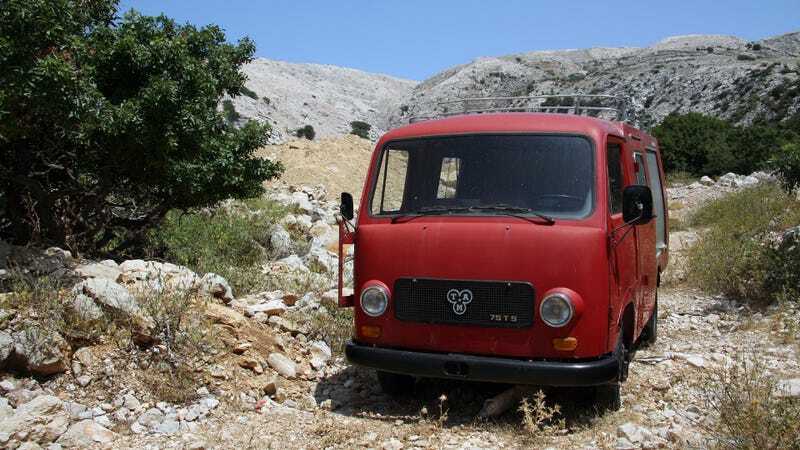 The fire truck you see above is an abandoned TAM 75 T5. TAM stands for Tovarna avtomobilov Maribor, a factory that went down not long after Yugoslavia did. 75 is the horsepower it had from a 3860cc Perkins diesel. T5? Payload in tons. Packed full of empty beer crates, there it was, standing still. Not unlike my Autobianchi a few miles away. In case you didn't know already, I work in Budapest, Hungary. I also got a 1985 Autobianchi A112 LX, a car in which a 965 cc four cylinder fights agains 1,684 pounds of steel and glass. I decided to take a week off, and go to the beach. It's a bit problematic since the country has been landlocked since 1920. This is where neighboring Croatia comes to the rescue with plenty of islands surrounded by crystal clear water. Now, highway speed is not something the A112 is particularly good at. Still, it can maintain a cruising speed of 70 mph, and if needed, will do more for overtaking. As you would imagine, there were massive traffic jams on the Croatian side as everybody wanted to get the the Adriatic Sea on a Saturday afternoon. Much younger cars gave up, boiling in the emergency lane, but the 'Bianci's engine temperature stayed normal. After many hours, we found ourselves on the beautiful Croatian island of Krk. At exactly the same moment, the alternator gave up. We had to push it in to reach the campsite. With no A/C during this trip to cool me down, I said some rude things about the car and Italian engineering in general. It's surprisingly easy to find a mechanic even in a place like this, but getting the job done is a different story. Since Monday turned out to be a public holiday, ordering parts and fixing her up could only start on Wednesday, but we didn't get the car back (or knew anything certain) until late Friday, a few hours after we've checked out. So, we had to skip driving and swim/drink more. The first task was to get there, the second to get home. The A112 almost did that perfectly too. On the way back, it surprised us by having no idle at all. The engine stopped every time I engaged the clutch. No problem at 70 mph, but a bit too adventurous in traffic. We made it, bit it was a close call. And costly too. The Croatian mechanic charged me $220 due to the fact that most of the alternator had to be replaced with new parts. He could also probably tell I was in a hurry and he obviously knew we were on an island. Fixing the rest (carburetor, ignition, and a new fuel pump since the old one was leaking petrol all over the engine) back at home was another $100. That's $320 I could have spent on getting a better suspension. So yes, my '85 supermini did take us there and back. A healthy 800 miles at full throttle. Everybody loved it on the highway, and it drives much better now than it did before the trip. Having said that, it didn't work properly, limiting our discoveries and causing frustration. It also made this trip $320 more expensive, at least $200 of which is money thrown out the window.